This is an endless source of amusement for the “old hands” and would make any pro editor throw his hands up in horror! Let me explain why because this point is one of the major sources of distraction for the potential buyer of editing software. When I speak of being “sold” on the bells and whistles and not the basics this one is the all-time champion. Transitions are the little inserts that go in between two video clips to make the scene change from the first to the second in a way that makes that change seamless. They take the viewer along with the story and in most cases the editor uses them to cause a desirable effect on the viewer as that change occurs. If you think about a scene change in any project you are doing there is always something you want the viewer to do as you change the scene and transitions help do that. Look at any movie you will notice that when the scene changes it either cuts directly to the next scene, fades to black and then into the next scene or the two scenes seem to merge together from the first to the second. These are generally referred to in order as a straight cut, a fade to black or a fade through black and finally a cross-fade or dissolve. Recently a number of TV shows have introduced the use of a very fast fade through white transition most noticeable on shows like the C.S.I. series. So, there you have it! The entire use of transitions on professional movie making. Count ’em folks…that’s four basic transitions and a possible fifth for special emphasis. Given that every brand of video editing software I recommend on this site has an average of about 50 transitions with most being customizable resulting in an almost infinite number, you can see why the original question causes so much amusement! Video transitions are part of the “language” of video and film. They convey meaning or mood and are not a feature in themselves. 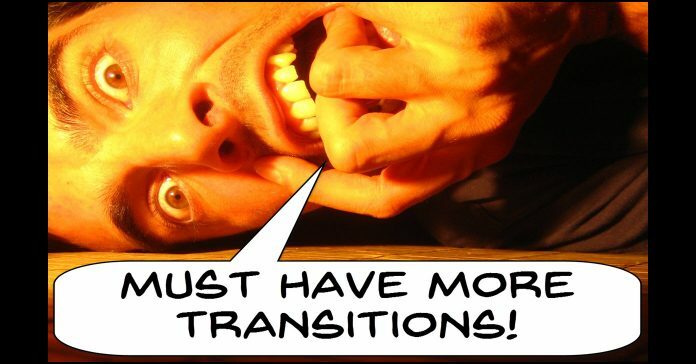 The point being that newbies use ALL the available transitions at every possible opportunity because they look so cool the first time they see them. The problem with that is that the novice video editor is creating something that to him, looks totally amazing but to another person watching looks confused or confusing at best and annoying at worst. If you want to create videos that other people will enjoy watching then the carefully considered use of video transitions go a long way towards achieving that end. As I mentioned earlier each transition will help you as an editor to keep the audience engaged in the story of the video without distracting them from it. Remember if a person notices the transition you have failed because the viewers attention has gone from the story onto your transition. The same could be said for special effects. Briefly stated here are a few of the reactions that the common transitions will cause in your audience when you use them. This is by no means a complete lesson! This simply means you go from one scene directly to the next. This transition (or lack of one) keeps the viewer’s attention on the continuing story without interruption. It tells them that we are continuing in the same place / time / event / situation. It’s actual purpose is to keep the viewer engaged by changing their perspective on the same scene. There are four uses of a black transition between two shots. 1. Fade From Black. This transition mimics the action of a human opening his or her eyes. It announces the beginning of something new and is generally used to start a project. A black screen slowly fades to reveal the first shot of the first scene. 2. Fade Through Black. This transition is used to end a sequence of shots that make up a complete scene. It is used to add finality to that series of shots and tells the audience that whatever was happening before has now ended (fade to black) and something new is about to begin (fade from black). 3. Fade to Black. This one tells the audience quite clearly that we are at the end. It adds finality to the story. 4. Straight Cuts to or From Black. These are used to add an intentional abruptness to the effect of using black between scenes as shown above. The effect is the same but more dramatic. These ones can be used a few ways but in general they have the same effect as a straight cut but in a gentler way. They can be used like a straight cut but in scenes where you want the cut to be smoother, gentler, less jarring. Their overall effect is the addition of time to the sequence. They can also be thrown in to break up a series of scenes where you are suing straight cuts but those cuts are becoming repetitive. They can be very effectively used to set a rhythm to your story. Outside of the above any other type of transitions should be approached with caution! Remember, when you are evaluating editing software, my advice to you would be to totally ignore video transitions as being any kind of deciding factor. All video editing software on the market has within its basic features many, many more transitions than you could ever need to create effective videos that communicate to your audience.